July 25 is National Wine and Cheese Day! You know Amazin’ Raisins taste great, but did you know they are an excellent source of polyphenols? All those antioxidant, free-radical fighting benefits that you can find in a glass of wine are also in raisins! Isn’t that Amazin’? We know kids love our Amazin’ Raisins fruit flavor-infused raisins, but there’s no reason why grown-ups can’t enjoy them, too! 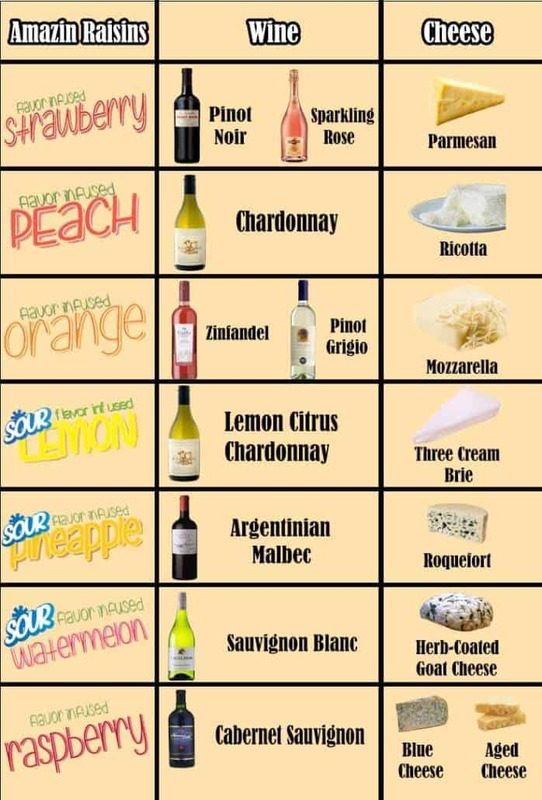 In honor of National Wine and Cheese Day, Amazin’ Raisin is proud to present… Wine, Cheese and Amazin’ Raisin pairings! • Amazin’ Raisin Raspberry flavor-infused raisins go great with a sweet desert port and crumbly, pungent Blue Cheese, or a tannic, full-bodied Cabernet Sauvignon and Aged Cheddar. • Amazin’ Raisin Strawberry flavor-infused raisins is the perfect partner for soft Brie and the light berry flavor of Pinot Noir, or a light, effervescent sparkling rosé and the saltiness of Parmesan. • Amazin’ Raisin Peach flavor-infused raisins pair perfectly with whole or melty Gruyere and the fruit and nut flavors of a nice Chardonnay, or a sweet, creamy Ricotta and tangy Riesling. • Amazin’ Raisin Orange flavor-infused raisins are great with two classics, Zinfandel and buttery Dorset, or an acidic Pinot Grigio and soft, slightly sweet Mozzarella. • Amazin’ Raisin Sour Lemon flavor-infused raisins is a bold pairing to bring out the lemon citrus flavor of Chardonnay, and a triple cream Brie sweetened with honey. • Amazin’ Raisin Sour Watermelon flavor-infused raisins are a unique pairing with the often-tropical flavors of Sauvignon Blanc and a nice, herb-crusted goat cheese. And of course, if you don’t drink or you have little ones you want to include in on the fun, Amazin’ Raisins and cheese make excellent pairings on their own! Salud!